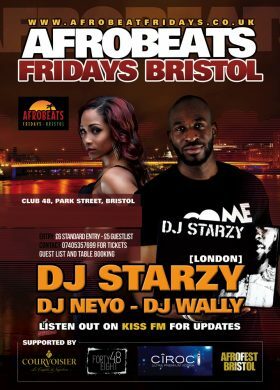 Home to Afrobeats Fridays Bristol, We currently run promoted nights on weekends, and are available for private hire from Sunday to Thursday. Examples of events we host include private dance lessons including Salsa and Kizomba, office parties and functions, birthday parties and one off club nights; we also offer great deals for clubs and societies and for large groups. Our drinks list represents great value for money and we have an extensive range, offering a £1 double up offer on nearly all spirits! We provide first class entertainment for everyone with music you can dance to in a safe and friendly environment. 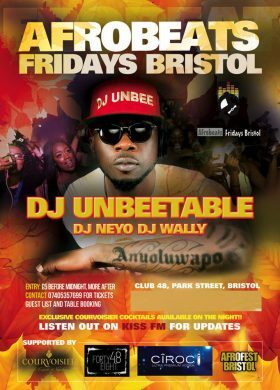 Located on a busy street especially at night, party with us at Club Forty Eight 48, PARK STREET, BRISTOL, BS1 5SG. 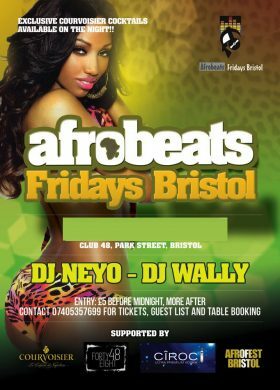 @Afrobeats Fridays Bristol, Partying having fun in a SAFE and friendly environment is our priority and with our professional and experienced door staff we can Guarantee that as usual. ALWAYS remember your ID. Help us Help you.